Jesus in the gospel last Sunday summed up the commandments into one commandment of love- love of God and love of our neighbor as ourselves. Certainly many of us have our own ways of listening and fulfilling this commandment. Some of us went to a mission or voluntary works. Some lived this out by being a loving and caring mother or father of the family. Still, some have carried this out by being there- personally touching the lives of many people by our presence, by our witness and by our example. Certainly we can do this in million other ways because ‘love isn’t a big thing, it’s a million little things’ according to the quote I found on the fridge in the house of our parishioners- a lovely couple who had just celebrated their 61st wedding anniversary. This means ‘don’t go there’, ‘careful’, or ‘don’t imitate them’. Instead, look at this widow and pray you may grow in such love of God as she had demonstrated. Two small coins are all that she got, yet she selflessly gave it all as offerings to God and to the temple. Her selfless love of God caught the attention of Jesus and thus she is worthy to be commended to his disciples. Unlike the scribes and Pharisees who might be giving so much but still only the surplus of what they have actually got, this widow gave her all. The widow’s offering is what the measure of generosity really is. It doesn’t matter how much we give. What matters is that how much does it cost us. For the widow in the gospel, it might cost her whole budget for meal for the day and for her son or daughter. Yet her love and generosity moved the heart of Jesus. For the widow of Zarepath in our First reading today, her generosity to the prophet Elijah had cost her of only remaining provision for her and for her son. And again, her generosity paid off. She and her son had enough sustenance and provision to last for a little longer than she thought. And Christ himself in our second reading today, his love and generosity cost him his own life. He laid down his life not only to save us but for us to live. Many a times, we give something away because we no longer need or want them. So love is less really of a motive there. So how can we give something, or ourselves with such a kind of love that Jesus has demonstrated in his life and death? Three ways. First, the widow in Sidon in our First Reading today would show us to share generously and lovingly even the very little that we have for the ones who is in need. She did it to Elijah and God has repaid her a hundredfold. She was provided not only for the day but for more days to come. She listened to Elijah and trusted that he is really a man of God. In a way by listening to Elijah, she was listening to God asking her to give up something for him. It is also our call that we take time to listen to God speaking to us now, and trust in him as he speaks to us in own particular situations and circumstances. We know this, if we come to an insight or an urge to live simply, and give generously. 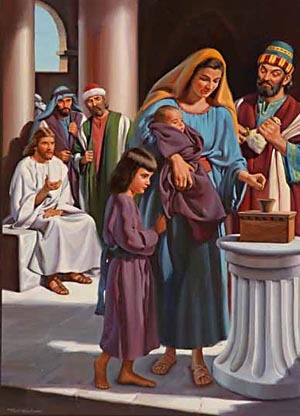 The second way is to imitate the widow’s selfless act as we heard from our gospel today. She gave everything she had, no matter how little. She could have justified herself by not giving it away since as a widow, she has no one to rely on. But she gave all that she had to live on as Jesus spoke of her in our gospel. . She gave it to express her love of God, with all her mind, with all her heart, with all her soul and with all her strength. Moreover, she didn’t care how humiliating might it have been, to have only two small coins dropped into the treasury of the temple. The third way to put love into our act of giving is in our Second Reading today. In the letter to the Hebrews read today, we heard of Jesus giving himself up, remember his very self for us. He sacrificed his very life by dying on the cross so that we may live. This is also a call for us. Like Jesus, we are also called to lay down our lives for others. But it is not a one-off challenge. It is to be our life everyday. This means that we not only remember God on Sunday but every moment in our life. For Jesus, the measure of generosity is not how much we give but on how much does it cost us. For him it cost him his life. This calls us to reflect on our act of generosity, may it be in our giving of our time, our talent or our treasures. Are we giving some things away because it is our surplus or extra, like what the scribes did in our gospel today? Or are we really giving ourselves and our selfless love into it?